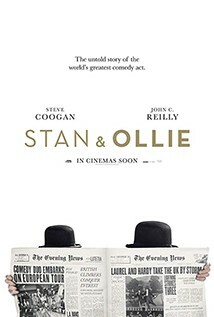 The beloved comedy team of Stan Laurel (Steve Coogan) and Oliver Hardy (John C. Reilly) made more than 100 films together from 1921-1951, before abandoning the screen for the stage. They embark on one last variety hall tour in Great Britain in 1953, but are surprised by the modesty of the bookings and cramped little guesthouses. They struggle for audiences and their booking agent seems disinterested. But a series of TV guest spots and celebrity appearances soon rekindle the country’s interest in their genius and the buzz grows as they head towards a big London finale. As the attention builds, so do their struggles with health issues, the changing times and the stress of the road, all threatening to overshadow their creative partnership. The world premiere of the film recently closed the 62nd London Film Festival.